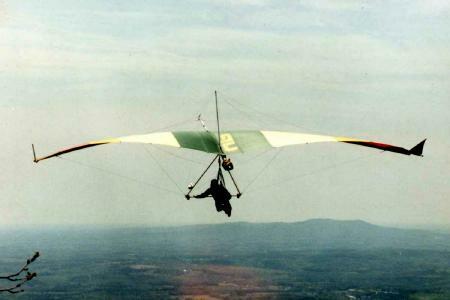 I just let him decide where we'd go"
Wind Drifter was the name of a small hang gliding school (I was the only Instructor) that operated near State College, PA in the late 80's and early 90's. I've kept the name just in case time and circumstances ever allow me to get back to teaching again. Some things seem to have a way of coming around again if you wait long enough. 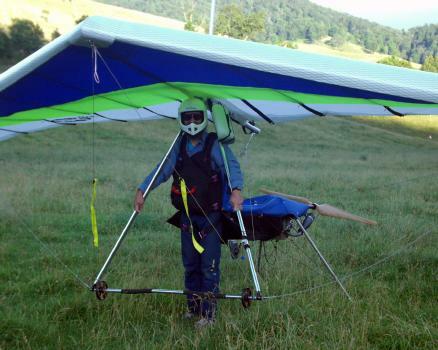 The first glider I flew from the mountains (1981) was a single surface bowsprit glider called a Mosquito. As you can see, whoever designed it must have owned stock in an aircraft cable company, it had more wires than any other glider I've ever seen! Now, 20 30 years later my newest flying toy is again a Mosquito, although this time it is a powered harness that bears the name. This web site is devoted primarily to foot launched flying, and because the Mosquito is my newest adventure, most of what you see will be about that!